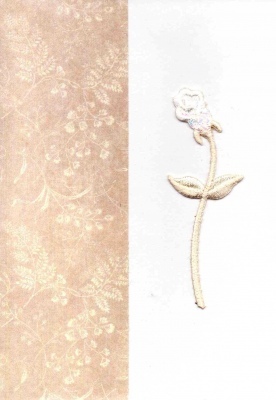 A beautiful classic wedding invitation featuring an ivory embroidered rose on a white card with an ivory patterend side border, comes complete with a white insert printed with all your wedding details and a white envelope. This wedding invitation is also available as an evening invitation, engagement invitation or anniversary invitation. A sample is available.